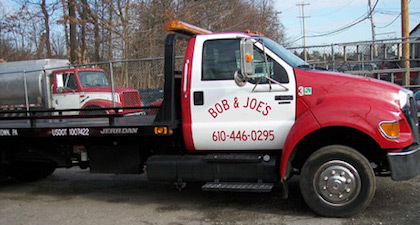 Bob and Joe’s PA towing fleet is large and diverse to handle all different types of jobs. 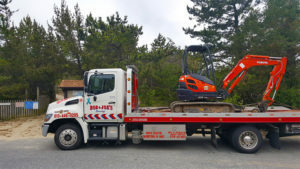 Our flatbed tow trucks are great for handling collision towing and other types of towing where wheel lift tow trucks just don’t cut it. With decades of experience we operate the best towing service in Southeast Pennsylvania including our flatbed towing. We are specialists in collision towing and are partnered with Direct Paint and Collision of Havertown which is a complete collision care center. Our flatbed wreckers are ready 24 hours a day to respond to an accident and get your vehicle towed for repairs. We make the process painless and ensure that no further damage is caused during loading and transportation of your car. Call us today and find out why we have been in business since 1964, we provide excellent service and great rates. We will get you off the road safely and back on the road quickly. When you are in an accident you have a choice of towing and repair services, choose the best, choose Bob and Joe’s.